31 Jan 2019 – The latest bizarre episode in the Trump presidency is currently playing out in Venezuela. Just weeks after President Nicolás Maduro’s inauguration, Trump officially recognized Juan Guaidó, the 35-year-old head of the National Assembly—a man who has never even run for president—as the rightful head of state. A White House statement (1/29/19) announced, “President Trump stands with the people of Venezuela as they demand democracy, human rights and prosperity denied to them by Maduro,” noting that the “people” had “courageously spoken out,” and that the US would pursue increased sanctions on the country. 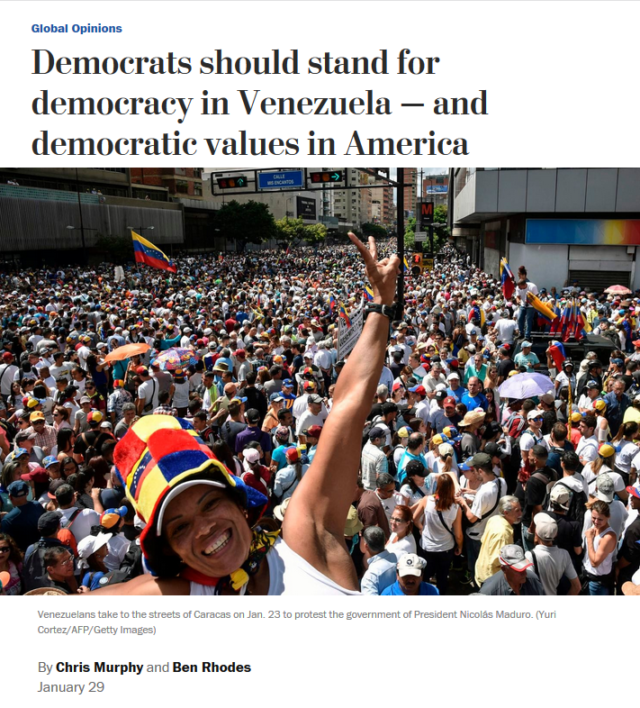 A Washington Post op-ed (1/29/19) declared that we should provide more support for “the Venezuelan people” who are demonstrating in the streets by working with the UN Human Rights Council to “tighten the sanctions” on Maduro, presenting a picture of the US leading a unified world against a dictatorship oppressing its people. But in reality, the UN Human Rights Council has formally condemned the sanctions, noting they “disproportionately affect the poor and most vulnerable”; it called on all member states to break them, and even began discussing reparations the US should pay to Venezuela. A UN rapporteur who visited the country described Trump’s actions as possible “crimes against humanity” (London Independent, 1/27/19). This has not been reported by the New York Times, Washington Post, CNN or any other US national media outlet. 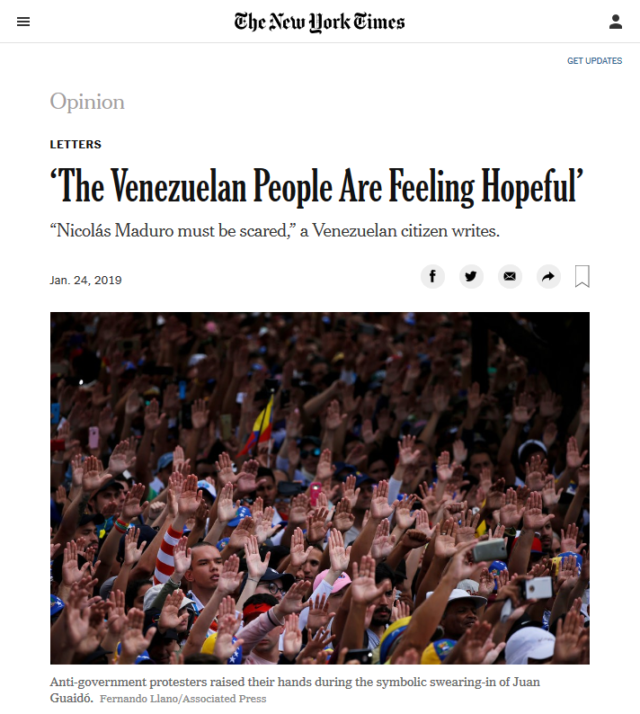 Ignoring all this relevant information, the Post (1/29/19) noted that the emergence of Guaidó has brought hope to the “Venezuelan people” (or “long-suffering Venezuelans”) for the “restoration of their democracy.” This is despite the fact that more than 80 percent of Venezuelans have never heard of Guaidó, and that the body he leads, the National Assembly, has an over 70 percent disapproval rating (roughly the same as the disapproval rating for Maduro). In a study of over 500 articles over a 16-year period published this week (Race & Class, 1/25/19), I found that terms like the “Venezuelan people” or “civil society” were used exclusively to refer to opposition groups in alignment with (and funded by) the US government. US intentions and actions in the country were consistently presented as democratic, regardless of their nature. Venezuelans despair at the lack of international interest in the political crisis that is rocking their country. Since anti-government protests began early last month, at least 34 people have been killed, most of them opposition supporters gunned down by security forces or government-backed gangs. 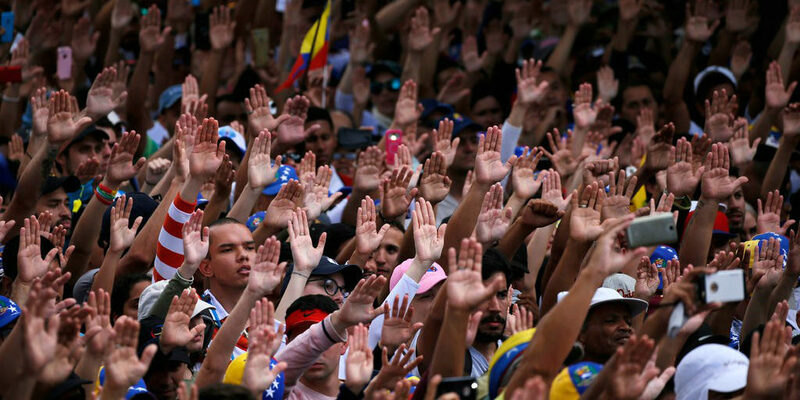 Venezuela certainly does need radical change, but erasing the voices and even existence of the people, as the media has done, will only hinder public understanding of the issue and hamper reconciliation. Alan MacLeod @AlanRMacLeod is a member of the Glasgow University Media Group. His latest book, Bad News from Venezuela: 20 Years of Fake News and Misreporting, was published by Routledge in April.